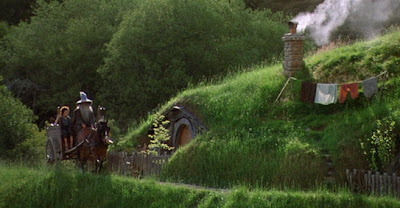 But sod houses aren’t all bad. The very sympathetic character Ivar lives in a sod house, and it seems a perfectly appropriate place for his barefoot, mystical personality. It’s just not the sort of place that’s wanted in the newly emerging domesticated landscape of plowed farmland and respectable farmhouses. the Hallmark production of O Pioneers! (1992). Early in the novel, Alexandra, her three brothers, and her friend Carl Linstrum travel out to see Ivar. Alexandra points out Ivar’s property and sod house to her youngest brother Emil. I wonder if Frank Lloyd Wright would approve? 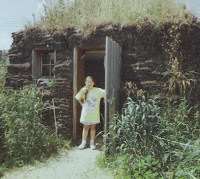 Ivar’s house is certainly “of the hill,” prairie-style! “That front wall was built of sod. Mr. Hanson had dug out his house, and then he had cut long strips of prairie sod and laid them on top of one another, to make the front wall. It was a good, thick wall with not one crack in it. No cold could get through that wall. 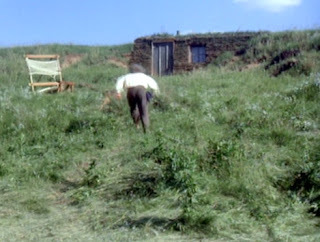 Except for the time when an ox put his rear leg through the roof, the Ingalls’ time in their sod house is fairly idyllic. Nevertheless, they’re all happy when Pa begins building a log house for them. It’s a step up. But what’s wrong with the humble nature of a sod house, barely visible in a hill? It’s good enough for Bilbo Baggins, after all!